Objective Parameter $β$ is the most commonly used anti-attack scaling ratio in boost normed singular value decomposition (BN-SVD). However, it requires numerous experiments to obtain and has randomness. Thus, an adaptive zero-watermarking algorithm based on BN-SVD was proposed. Using this parameter presents three advantages. 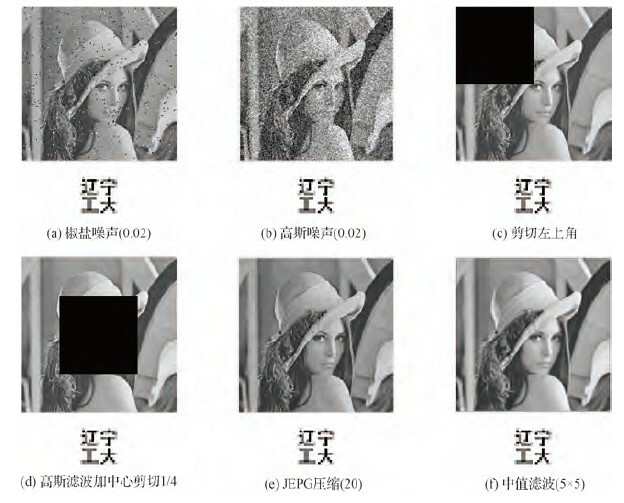 First, the singular value of the image is enlarged, the sensitivity of the image to attacks is reduced, and the robustness of the algorithm is improved to some extent. Second, singular values are limited to a certain range. The diagonal distortion problem can be solved by equalizing the grayscale in the diagonal direction. Third, a singular value vector is specialized, and the corresponding relation between a singular value vector and an image is specialized to one, such that singular values can represent the features of the image. Thus, the problem of false alarm error is solved. Method First, the original image was divided into non-overlapping blocks. Then, slant transform (ST) was performed on each block matrix. BN-SVD was used on each block matrix after ST to achieve a maximum singular value, and a feature vector was created by comparing the maximum singular value with the average maximum singular value. The watermarked image was processed by Arnold transformation and logistic mapping to obtain an encrypted and scrambled double-encrypted watermarked image. Finally, the zero watermark was constructed using the feature vector, and the double-encrypted watermarked image was used for XOR operation. During optimization, parameter $β$ was determined by training and updating continuously through the BAS fitness function. 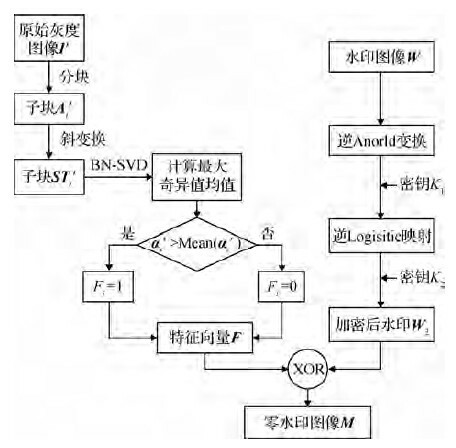 Similar to genetic algorithm, particle swarm optimization, and so on, the proposed algorithm does not need to know the specific function form and gradient information. The optimization process can be realized independently, and its characteristics were single individual, less computation, and faster optimization speed. The algorithm was inspired by beetle search behavior. The biological principle is as follows:the beetle relies on the strength of the food smell to find food. Two antennae were randomly used to search nearby areas. When the antennae on one side detected a higher concentration of odors, the beetles turn in that direction. According to this simple principle, the beetle can effectively find food. Results Under JPEG compression, rotation, filtering, clipping, and other attacks, the normalized coefficients of the extracted watermarked images and the original watermarked exceeded 98%. 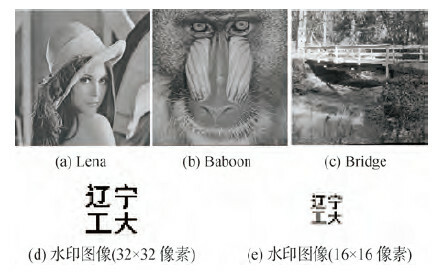 Lena, Baboon, and Bridge were selected as the original grayscale image, and two different sizes of "Liaoning Technical University" were chosen as binary watermarking images. Several sets of experiments were conducted. 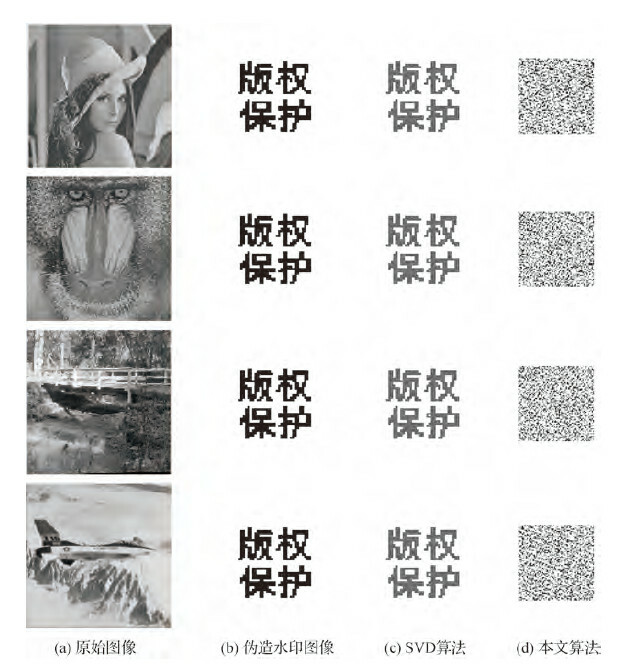 In the experiment, a normalized correlation coefficient (NC) was used to analyze the similarity between the original watermark and the extracted watermark, and the optimal parameters $β$ for the 16×16 pixels and 32×32 pixels watermarked images were found by the BAS optimization algorithm. The optimum parameter $β$ values of the three gray images of Lena, Baboon, and Bridge were 0.298 3, 0.642 4, and 0.533 2 for the 16×16 pixels watermarked images and 0.737 0, 0.991 4, and 0.873 5 for the 32×32 pixels watermarked images. The experimental results revealed that with the increase in attack intensity and mixed attacks, the NC value of the watermark is affected. However, most NC values exceeded 0.99. The NC value of the watermark extracted after geometric attacks, such as clipping and rotation, was close to 1. Given that the original gray image was rotated, and some pixels were lost in the clipping process, the watermark generated was incomplete. A larger compression attack parameter corresponded to a larger NC value, indicating that the algorithm had better resistance to JPEG compression. For all kinds of noise attacks, the NC value of the extracted watermark can exceed 0.99. Conclusion BAS algorithm can be used to adaptively determine parameters $β$ in BN-SVD. The optimal scale of scaling enhanced the singular value of the image and reduced the sensitivity of the image matrix when attacked. 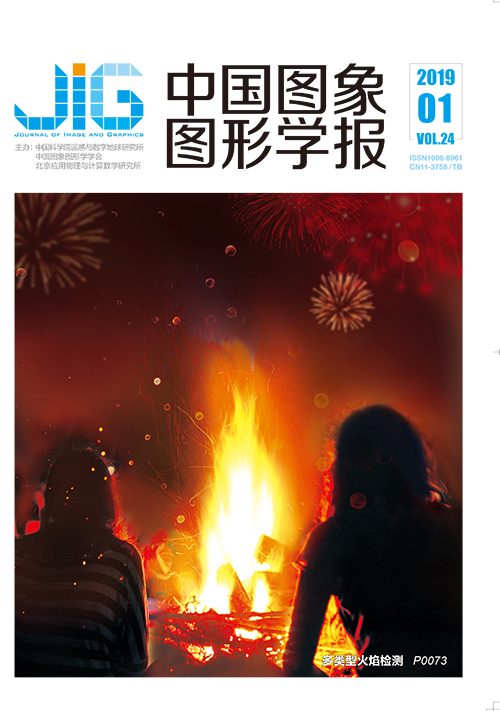 The problems of diagonal distortion and false alarm error caused by singular value decomposition were solved effectively, and the robustness of the watermarking algorithm was improved. 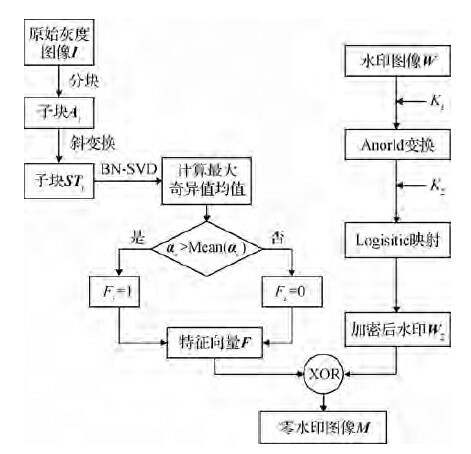 Compared with other traditional optimization algorithms, the BAS algorithm presented the advantages of short training time, fast convergence speed, and good robustness. By integrating the concept of zero watermark, the contradiction between robustness and invisibility of the watermark is solved. Thus, the robustness of the watermarking algorithm was improved. Jiang X Y, Li S. BAS: beetle antennae search algorithm for optimization problems[EB/OL].2018-06-25]. https://arxiv.org/abs/1710.10724. Jiang X Y, Li S. Beetle antennae search without parameter tuning (BAS-WPT) for multi-objective optimization[EB/OL].[2018-06-25]. https://arxiv.org/abs/1811.02395.